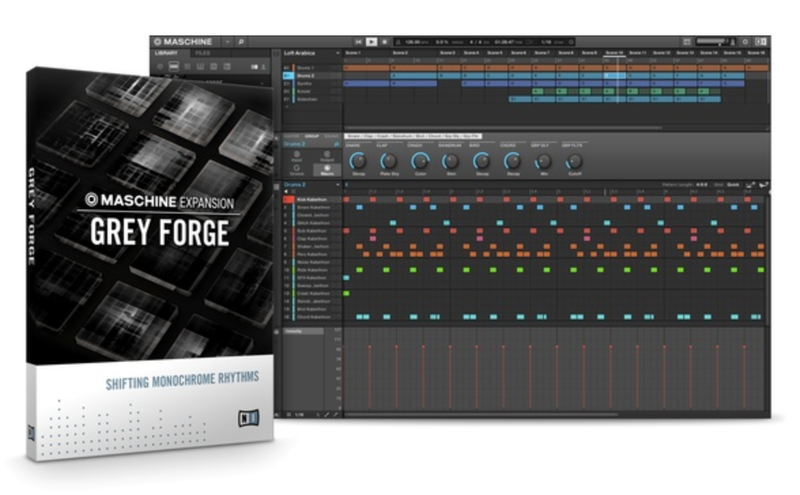 Native Instruments has announced the release of Grey Forge, a new Maschine Expansion for dark, monolithic techno productions and live performances utilizing the unique features introduced in MASCHINE 2 software. GREY FORGE comes with 45 drum kits. Fully taking advantage of the MASCHINE 2 software’s Drum Synths, 14 kits contain pre-mapped macro controls to MASCHINE’s display knobs. Macro controls allow for creative beat morphing and total control over key parameters in each of the kits. A further 230 Drum Synth presets offer a high variety of new sounds for producers to experiment with. Focusing on pulsating, raw, and stark techno styles, producers can build on rhythms with an array of grainy bleeps and one shots sampled from custom modular synths. Plus, 40 new MASSIVE presets provide intense basses and leads designed to cut though the mix in any club. GREY FORGE comes with custom-built effect chains that load within a drum kit for fast access to additional atmospheres and textures. Parameters of some single effects are also pre-mapped to the eight display knobs on the MASCHINE STUDIO and MASCHINE hardware units, for adding live, on-the-fly tweaking while performing a techno set. With 9 full projects included, GREY FORGE also provides plenty of inspiring grooves to jumpstart the creative spark. GREY FORGE is also available as an iMASCHINE Expansion, and features 2 projects and 4 kits for instant use in creating slabs of uncompromising techno. Tracks can be exported to MASCHINE STUDIO, MASCHINE or MASCHINE MIKRO for completion. Grey Forge is available to purchase for $49 USD / 49 EUR / £42 GBP. The iMaschine expansion is an in-app purchase, priced at $0.99 USD / 0.89 EUR / £0.69 GBP.